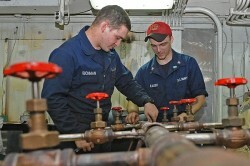 HT’s aboard USS George Washington construct a method to fill up multiple water jugs during HADR Operations. You cannot force innovation. Especially in the Navy. “Precisely,” I scream internally amongst my fellow Starbucks typists. Innovation is not just sitting around thinking stuff up – it is identifying a problem, often taking a Departure from Specifications, and coming up with a new solution, therefore making your respective process more efficient. This stands apart from, as some try to compare, the process that brought us our much beloved password keeper: the Post-it Note. While I wish to claim dictionary-supported victory, Webster continues: “To introduce as, or as if, new.” And here is the rub. What is the Navy trying to push us to do? Solve problems or think stuff up? In reality, it is both. We need to clearly distinguish between innovation, which is the act of finding a new way to solve an identified problem, and creativity, which boils down to investing in our future. “Semantics,” you say. I disagree, and I believe that this line in the sand will help organize our service’s efforts more efficiently. When it comes to my definition of innovation, the Navy is spinning its wheels. Innovation will boom when Big Navy opens its ears and shuts its mouth: it must listen, implement, and highlight successful innovations. Why tear down people trying to improve the Navy? Why do you dislike the Innovation Campaign? These are questions I hear asked by people enamored by flashy websites and new catch-phrases like “disruptive thinkers” or “crowd-sourcing.” I do not hate innovation – I believe it has a valuable place in our Navy. I do not hate creativity – I think it has a valuable role in our future. I do dislike the Navy’s Innovation Campaign, though, because it misses the point of innovation, it blurs the line between innovation and creativity, and because the Navy is taking the wrong approach. We do not require a bottom-up invigoration. Innovation happens where it matters most: at the source of “the problem.” It does not happen because of symposia or blog posts. It happens because our people are both creative, and selfish. Guests listen to Admiral Haney speak at the Pacific Rim innovation symposium, held at SPAWAR San Diego in 2012. Let me explain that last point. While some see the selfish streak as a bad thing, it is present in every person and can be harnessed. What does it mean in this context? It means that our people hate having their time wasted. They are always looking for a better answer to the problem, whether it is using red headlamps on the navigation table instead of those clunky Vietnam-era L-flashlights, or using Excel instead of R-ADM for watch bills. They are being selfish because they are looking to make their lives easier – they are being innovative because they are finding a new solution to an existing problem. Campaigns do not inspire these improvements and good deck-plate leadership can corral this so-called selfishness into constructive innovation, and steer clear of gun-decking. “They are not going to listen anyways, so why should I do anything differently?” This brings us full circle to the Navy’s current push for innovation. The Navy wants to capture fresh ideas and the operational experience of our young leaders. To achieve this, Big Navy needs only to stop talking. No websites or outreach groups are required. If they listen, they will hear their Fleet being innovative. Many instructions are written in blood, and while we should not forget that, we should recognize that there is a way to ensure combat superiority and safety, while still applying real-world common sense. Operators in the Fleet do not need to be patronized. They just need the Navy to listen, and whenever possible, defer to the operator over dusty publications. When a good idea makes sense, operators need the Navy to implement it and promulgate it to the rest of the Fleet through every available channel – from press releases to school-house curriculums. The innovation should be made official through integration into instructions and strategic communications – highlight it, not for fame or fortune, but rather, so that a Sailor does not find the problem he just solved, a year later at his next command. Innovation is happening in the Fleet. Many of these every-day solutions become so incorporated into a unit’s routine that they are hardly thought of as innovations – they are rarely publicized, and when they do spread, it is almost always via PCS-Pollination. These life-hacks allow us to operate more efficiently, but also ensure that we are often coloring slightly outside “the lines.” How many of these mini-innovations have become standard issue, or have been deemed to be, “in accordance with?” Everyone knows that these gems are out there. Yet, they stay at the unit level – effective little outlaws, getting the job done, but waiting to sabotage the checklists of your next INSURV. What is the Navy missing? An AH-1W Cobra launches for a CAS mission in Afghanistan. Pilots routinely sorted through 30 pounds of charts in the cockpit to execute their missions. Here is battlefield innovation – no campaign required. This meets most of the wickets laid out earlier: the Marine Corps listened and they implemented, but how well did they highlight this successful innovation? The target audience is the entire Corps; they need to know that their leadership will listen and take action when sensible solutions rise to the surface. Another mark in the win-column is the improved watch bill and daily routine spearheaded by the Captain and crew of SAN JACINTO. One of the most well-known parts of being a surface Sailor is being constantly exhausted. Exhausted to your core. Scientifically drunk with exhaustion. I myself have two friendly sets of binos KIA on my record from falling (asleep) from a standing position. Whereas I was once expected to launch helicopters “drunk” in the middle of the night, as I return to sea, I will now be expected to potentially launch missiles “drunk” in the middle of the night. The folks aboard SAN JAC worked together to find a solution to this identified problem and came up with a 3-on, 9-off routine. This approach meets the initial definition of innovation. It was a new way of doing business, both safer and more effectively. Community leadership liked it, and promulgated it – not as a mandate, but rather, as an innovative solution that could be implemented (with the underlying tone being, “We don’t want drunk watch standers”), and highlighted it through press releases, message traffic, and direct TYCOM action. Bravo. Innovation. So innovation is out there. Big Navy just has to listen. We need a receptive culture, not a fancy campaign. We do not need hollow initiatives from on high, but rather, we need the Navy to let us do our jobs. When we come up with better ways to do our jobs, we need the Navy to have our back. We do not have money to waste. We must take an approach to our expenses that defers to operational forces – ships, subs, aircraft, and their associated operators – with a balanced approach to “investing in creativity.” It would be irresponsible to ignore the future and the ideas of our more creative junior people, but it is also irresponsible to spend vast sums on them to sit around and think stuff up. This is where I think we need to differentiate between our approach to innovation, and our approach to fostering creativity. Innovation will continue to happen, no matter what I or anyone else thinks or does about it. People are always going to find an easier way. So what do we need from the Navy? We need a culture that expects leaders to consider the insight of the doers. This improved culture does not need to be whiz-bang or flashy. As efforts such as ColabLab and MMOWGLI and RAD have sputtered over the past year, Sailors continued to innovate in the Fleet. Our Marine pilot and ship Captain did not look to a website for “likes.” They had a problem identified and they endeavored – they innovated – to fix it. Innovation – the act of solving problems with new ideas – should have minimal organizational involvement until the implementation stage. The culture, which will take time to establish, should provide a direct conduit from the operator to the command that makes the applicable decisions. No middle man or think tank, but rather decision makers – like the TYCOMs – clearly demonstrating that they want to hear the innovative solutions coming from the Fleet and that they will personally take action to implement those that make our Navy better. Investing in creativity is more complicated. A rudimentary look at the budget shows us that, in general, new money is not budgeted, but rather, re-allocated. In other words, if our budget is (for simple argument) $1 billion, it does not become $1 billion + x to help us fund our creative thinkers. Rather, “x” is taken from Program Y to fund said creative thinkers. The question, from The Girl Next Door, becomes, “Is the Juice Worth the Squeeze?” Are the creative thinkers more important than Fleet Experimentation, or “pick your project/funding line?” What is our tolerance for failure? How can we capture the operational experience of our junior-leaders unseen for the past 40 years? The Navy should encourage and facilitate creativity. The CRIC was a good start. It commenced the tearing down of stovepipes amongst junior leaders and got free-radicals thinking of ideas that grey-beards would never come up with. As a way ahead, we need to clarify the group’s mission and get them focused on creativity. The group, which is currently disaggregated, would evolve into a directorate made up of young, seasoned “egg heads” who would be incorporated into an existing command. With an infrastructure and existing budgets, as well as the requisite people to provide support and continuity with an assortment of know-how (all things they lack now), this organization – the Young Leaders Creativity Cell (Y-LCC) – will become the receptacle for new ideas still in need of development flowing in from around the Navy and an incubator for creativity in our service. Creativity – tomorrow’s next “Post-It Note” – may help us win the next war. It takes time, though, and requires a tolerance for failure, which necessitates a separate approach from innovation. If we want the next Skunk Works or Post-It note or iPhone, we must encourage the participation in such extra-curricular groups as the ATHENA Project, Disruptive Thinkers, CRIC(x), and the Defense Entrepreneurs Forum – exposing our most fertile minds to different perspectives and making these junior officers more effective leaders and innovators in the Fleet, where it matters most. LT Jon Paris is a 2005 graduate of The Citadel and a Surface Warfare Officer. He has served aboard destroyers and cruisers, as a navigation instructor, and is currently a Flag Aide in Norfolk, Virginia. His opinions are his own and do not reflect those of the Navy or his current command. You had me at R-ADM vs. Excel Watchbills. Good stuff. If the CNO wants support, a good place to start is with a “climate” push coming down from Commodores to unit CO’s. If the CO knows their boss is onboard with creative approaches that may not be in accordance with, then they are more likely to be receptive to deck plate ideas. Undisciplined innovation SHOULD be squashed. Just because you can do something more efficiently doesn’t mean it meets the requirement…which means that in order to make your case for innovation, you need to ENGAGE your leadership and ADVOCATE for why you want to change STANDARDS. The REQUIREMENTS are generally there for a good reason. So a little vignette regarding your beef with R-ADM; as a former Surface navigation instructor, you should appreciate this. R-ADM’s database provides watchbills that are vetted against ACTUAL QUALIFICATION in the servicemember’s record. An excel spreadsheet does not. Granted, a signed excel spreadsheet means that the signators are confident that whatever process you used to say that those watchstanders are “qualified” actually ARE qualified. In fact, it’s the way we did watchbills prior to R-ADM…and on the grease-penciled Watch, Quarter, and Station Bill before that. It’s all about the confidence you have in your process. Point is, R-ADM is a tool that already validates qualification requirements, which are created when your database administrator puts the watchbill together. Position: helmsman. Requirement: Helmsman or Master Helmsman PQS for the watchstation. Query: qualified? It was an ‘innovation’ designed to keep CO’s from needing to see every last qual card every time they bottom-lined a watchbill…because the amount of “the PQS is in the chop chain” BS is RAMPANT in the Fleet, especially among the increasingly youthful CPO Mess. 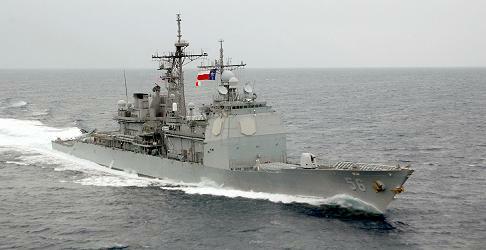 So here’s your vignette: USS La Moure County grounded off the Chilean coast in 2000. The SIGNED WATCHBILL had several key watch positions filled by watchstanders who were not qualified. Would R-ADM have helped? Would it have held supervisors to qualification standards? Would the CO at least have been aware that so many of his people weren’t qualified? Innovation on the deckplates normally means “Git ‘R Done!” faster…but not necessarily right. Can Do, Will Do…Do Do…is a great motto for the deckplate ethos…but a failure to carefully manage the former will usually leave the latter on your boondockers. Keep your ears open, indeed…but do not be afraid to stand athwart this ‘culture of innovation’ when efficiency attempts to trump prudence. Lt: I agree with your basic premise that whether something is innovative or creative, it IS being done in the fleet. We are a competitive sort, always trying to do one better than the squadron, ship or submarine down the pier. If we COMMUNICATE these small jewels of constructive thought that better our organizations through a centralized innovative forum, we will find others who either, themselves take on the new thought to the betterment of their organization or, better yet, say.. “we can go one better”. Great improvement generating thought, whether it be innovative or creative, can come in small packages. If we can just “copy and paste”, we are a better organization. Now, what is that large Navy forum? Interesting that you use the HTs in Operation Damayan as an example; see what HTs did during post-earthquake recovery ops in Haiti. Would the HTs in the Philippines have been better served just copying their predecessor’s ops? Or at least knowing what their predecessors did? I sent an article to Proceedings last week called “A Time to Innovate, A Time to Steal” that talks to a lot of what you note here – we’ll see if it gets picked up, but I could send you the draft if you like. I brought up the situation with the GW HT’s in the associated episode of Sea Control as indicative of the problem of the Navy not implementing and publicizing (the last two stages of my innovation cycle) and address it in my article by talking about how bad it is for a Sailor to have innovated a solution and then see the same problem on his next ship. The HT situation is a perfect example of a the current failure of the Navy to approach innovation intelligently, as well as the failure of the Navy Lessons Learned System (NLLS). “It happens because our people are both creative, and selfish.” Yes. Excellent article LT Paris. Consider submitting elsewhere. The entire post should be pushed far and wide. Kelly Johnson’s 14 Rules of Management is a must read for all that are following their innovation hearts. I also second Mary Ripley’s comment on publishing. An drive to appear innovative without the actual knowledge to do so can become dangerous. A DDG on deployment in 2013 implemented SAN JAC’s circadian rhythm watchbill in name, but not in spirit. The command did not support the circadian rhythm the way it was designed and held extraneous meetings and briefs during “quiet hours”. Officers were forbidden to be in their racks between 0630 and 1830, regardless of watch schedule. The result was watch standers who stood the 00-03/12-15 for 2 weeks straight, but were unable to sleep during the day to make up for it. The point being, don’t pretend to be innovative just for a FitRep bullet. If you are going to do something new, do it right.